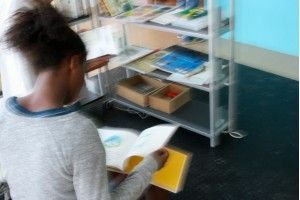 At ACVic, we have created a new reading space where children, teenagers, families, educators... where we can discover various illustrated books, pictures, albums or interactive books, to inspire them to create, experiment and play through contemporary artistic activities. In playful surroundings, you can discover art books and do the activities, making use of materials which will be provided and the help of the specialists. You'll discover new ways of playing with creativity, including various ways of understanding the contemporary arts. - Accompanied children, and young adults and family groups. Discover, read, create and experiment together. - Teachers seeking to bring new activities in the classroom. - And anyone interested in discovering new play and educational resources within the field of the visual arts. * The ACVic team can offer help to anyone using the Miniespai, and the books to be found there.